Much like the main living spaces in your timber home, your master bathroom should be planned to accommodate the way you live. So how do you create a bathroom that suits your style and fits your needs? 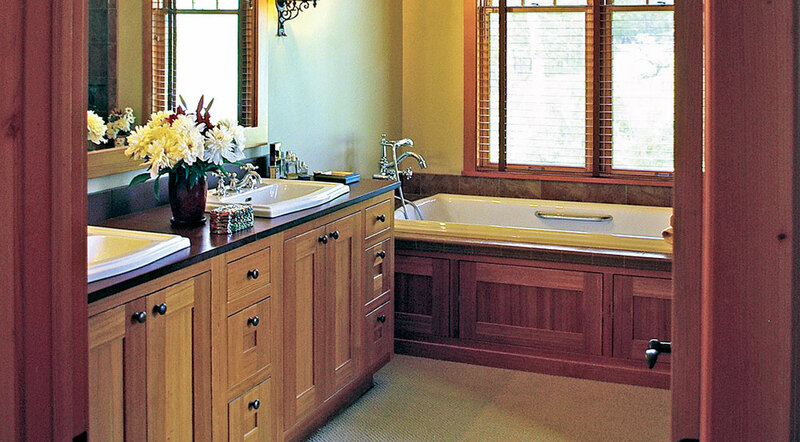 We asked Ty Allen, design group manager at New Energy Works Timberframers, for his tips on creating the best master bathroom. Here’s what he had to share. 1. Get in the zone. “These days, many homeowners want to create a spa-like feel in their master bathroom,” says Allen. “If they want to include a soaking or Jacuzzi tub, it’s best to set up zones, rather than make the space too compact.” In that kind of arrangement, you may not want the tub mixed in with everything else, so think about positioning the tub on an outside wall or in a corner, surrounded by lots of windows, to create a nice place to sit and soak. You’ll also want to design specific areas for the other functions in your bathroom. For your sinks, design a contained counter area or a wall against which a sculptural pedestal sink can be displayed. If you’d like your fixtures to be a focal point, keep some wall space clear so that they can shine. 2. Use your space wisely. In looking at your zones, decide if the toilet needs its own room or whether it can be part of the open bathroom. “Clients often ask for separate, or walled-off, toilet areas, but there are better ways to use your space,” Allen explains. “Recently, we’ve been creating privacy by including what we call a ‘screening wall,’ which is a lower wall that you can see over.” By including this kind of wall, you’re also providing a space for extra storage because you can make it as deep as you’d like. For example, on the toilet side, there might be a spot for magazines or toiletries, and on the other side, there might be shelving for small home accessories or linens. “Timber framing is almost always a challenge in a master bathroom,” says Allen. Here’s why: Placing a shower in a corner can be difficult when there’s a wooden post there. If you do put your shower in the corner, you’ll have to encase the post somehow to create water tightness. Exposed timbers will also require planning for humidity and moisture. Avoid tongue-and-groove construction, which can expand in high-moisture areas, or a vaulted ceiling, which is more susceptible to moisture damage because of restricted air-flow cavities. Also, flat, drywalled ceilings keep steam in and trap moisture better; if your home’s a hybrid, you may want to reconsider the inclusion of timber framing in the master bathroom. According to Allen, anytime you have a bathroom upstairs, it’s tricky trying to figure out the plumbing. One good go-to solution is to create a mechanical space between the floor of the bathroom and the ceiling below. “You’ll often have timber joints in the room below, and on top of that, you’ll have a tongue-and-groove ceiling or some other sort of shallow system,” he says. “Instead, talk to your builder about creating a deeper space by using some 2-by-8-inch framing in the ceiling and lower the timber-frame areas in the spaces below. This way, you can create more depth and get piping and supply and waste lines out.” This will give you more freedom in how you lay out your master bathroom, and it will provide greater flexibility if you decide to change your layout in the future.